Modammednoor finished an undergraduate degree in Jordan, a Masters degree from Sydney University and a PhD form the University of Newcastle. 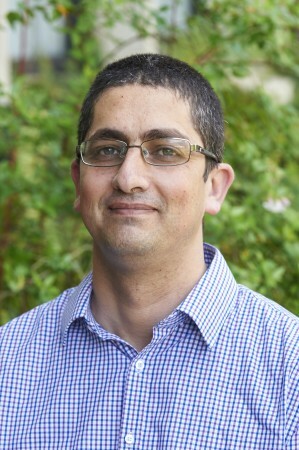 He had worked for three years as an Assistant/Associate Professor in Jordan before taking on a University Fellowship at The University of Newcastle in the Discipline of Chemical Engineering (Priority Research Centre for Energy). His research focuses on the investigation of chemical phenomena using quantum chemical methods. His work has resulted in the publication of 45 scholarly journal articles, 20 conference papers and 1 invited plenary lecture. Mohammednoor’s interests are in the fields of reaction mechanisms and kinetics for the formation of organic pollutants and oxidation of hydrocarbons. His research on combustion helped him to be awarded the prestigious Bernard Lewis Fellowship by the International Combustion Institute. Formation of brominated dioxins from sleeted brominated flame retardants. Combustion of sulphur containing compounds. Dlugogorski & Altarawneh, Spontaneous Ignition in Fires, $ 570,000, funding body: ARC, 2014-2016. Studentship by the Jordanian Ministry of Higher Education to study Master and PhD in Chemical Engineering. Bernard Lewis fellowship. Certificate and funds to cover all expenses to support attendance at The 33th International Combustion Symposium in Beijing (1-5 August 2010). Hamdi, D., Jiang, Z., No, K., Rahman, M., Lee, P., Linh, N., Kim, J., Altarawneh, M., Thair, L., Jumaa, T., Dlugogorski, B., (2018), Biocompatibility study of multi-layered hydroxyapatite coatings synthesized on Ti-6Al-4V alloys by RF magnetron sputtering for prosthetic-orthopaedic implant applications,	Applied Surface Science, 463, 2019, . Jaf, Z., Altarawneh, M., Miran, H., Jiang, Z., (2018), Geometries, electronic properties and stability of molybdenum and tungsten nitrides low-index surfaces,	Materials Research Express, 5, 12, . Mohammadpour, E., Altarawneh, M., Al-Nu'airat, J., Jiang, Z., Mondinos, N., Dlugogorski, B., (2018), Thermo-mechanical properties of cubic titanium nitride,	Molecular Simulation, 44, 5, pages 415 - 423. Sim, S., Bashid, a., Lim, H., Altarawneh, M., Jiang, Z., Eksiler, K., Likubo, S., (2018), Development of Organo-Dispersible Graphene Oxide via Pseudo-Surface Modification for Thermally Conductive Green Polymer Composites,	ACS Omega, 3, 12, . Hamra, A., Lim, H., Hafiz, S., Kamaruzaman, S., Rashid, S., Yunus, R., Altarawneh, M., Jiang, Z., Huang, N., (2018), Performance Stability of Solid-State Polypyrrole-Reduced Graphene Oxide-Modified Carbon Bundle Fiber for Supercapacitor Application,	Electrochimica Acta, 285, , pages 9 - 15. Miran, H., Altarawneh, M., Widjaja, H., Jaf, Z., Rahman, M., Veder, J., Dlugogorski, B., Jiang, Z., (2018), Thermo-mechanical properties of cubic lanthanide oxides,	Thin Solid Films, 653, , pages 37 - 48. Ahmed, O., Altarawneh, M., Al-Harahsheh, M., Jiang, Z., Dlugogorski, B., (2018), Recycling of zincite (ZnO) via uptake of hydrogenhalides,	Physical Chemistry Chemical Physics, 20, 2, pages 1221 - 1230. Miran, H., Altarawneh, M., Jaf, Z., Dlugogorski, B., Jiang, Z., (2018), Structural, electronic and thermodynamic properties of bulk and surfaces of terbium dioxide (TbO2),	Materials Research Express, 5, 8, . Ahmed, O., Altarawneh, M., Al-Harahsheh, M., Jiang, Z., Dlugogorski, B., (2018), Catalytic de-halogenation of alkyl halides by copper surfaces,	Journal of Environmental Chemical Engineering, 6, 6, . Jaf, Z., Altarawneh, M., Miran, H., Almatarneh, M., Jiang, Z., Dlugogorski, B., (2018), Catalytic Hydrogenation of p-Chloronitrobenzene to p-Chloroaniline Mediated by -Mo2N,	ACS Omega, 3, , . Miran, H., Jiang, Z., Altarawneh, M., Veder, J., Zhou, Z., Rahman, M., Jaf, Z., Dlugogorski, B., (2018), Influence of DC magnetiron sputtering reaction gas on structural and optical characteristics of Ce-oxide thin films,	Ceramics International, 44, 2018, pages 16450 - 16458. Brombh, T., Ibrahim, K., Kabir, H., Rahman, M., Hasan, K., Ferdous, T., Taha, H., Altarawneh, M., Jiang, Z., (2018), Understanding the impacts of Al+3-substitutions on the enhancement of magnetic, dielectric and electrical behaviors of ceramic processed nickel-zinc mixed ferrite: FTIR assisted studies,	Materials Research Bulletin: an international journal reporting research on the synthesis, structure, and properties of materials, 97, , pages 444 - 451. Jaf, Z., Altarawneh, M., Miran, H., Jiang, Z., Dlugogorski, B., (2018), Hydrodesulfurization of Thiophene over -Mo2N catalyst,	Molecular Catalysis, 459, , . Miran, H., Rahman, M., Jiang, Z., Altarawneh, M., Chuah, L., Lee, H., Amri, A., Mondinos, N., Dlugogorski, B., (2017), Structural and optical characteristics of pre and post-annealed sol-gel derived CoCu-oxide coatings,	Journal of Alloys and Compounds, 701, , pages 222 - 235. Assaf, N., Pierre, M., Altarawneh, M., Radny, M., Jiang, Z., Dlugogorski, B., (2017), Structure, Stability, and (Non)Reactivity of the Low-Index Surfaces of Crystalline B2O3ï¿½I,	The Journal of Physical Chemistry Part C: Nanomaterials, Interfaces and Hard Matter, 121, , pages 11346 - 11354. Ahmed, O., Altarawneh, M., Jiang, Z., Al-Harahsheh, M., Dlugogorski, B., (2017), Reactions of products from thermal degradation of PVC with nanoclusters of a-Fe2O3 (hematite),	Chemical Engineering Journal, 323, , pages 396 - 405. Al-Nu’airat, J., Altarawneh, M., Gao, X., Dlugogorski, B., (2017), Reaction of Aniline with Singlet Oxygen (O2 1ï¿½g),	The Journal of Physical Chemistry Part A: Molecules, Spectroscopy, Kinetics, Environment and General Theory, 121, 17, pages 3199 - 3206. Muniandy, S., Kaus, N., Jiang, Z., Altarawneh, M., Lee, H., (2017), Green synthesis of mesoporous anatase TiO2 nanoparticles and their photocatalytic activities,	RSC Advances, 7, 76, pages 48083 - 48094. Inderan, V., Arafat, M., Kumar, S., Haseeb, A., Jiang, Z., Altarawneh, M., Lee, H., (2017), Study of structural properties and defects of Ni-doped SnO2 nanorods as ethanol gas sensors,	Nanotechnology, 28, 6, pages 1265702 - 1265712. Lim, H., Hamra, A., Altarawneh, M., Jiang, Z., Huang, N., (2017), Functionalized graphene oxide-reinforced electrospun carbon nanofibers as ultrathin supercapacitor electrode,	Journal of Energy Chemistry, 26, 4, pages 790 - 798. Altarawneh, M., Jiang, Z., Mondinos, N., Dlugogorski, B., (2017), Electronic properties and stability phase diagrams for cubic BN surfaces,	Molecular Simulation, 43, 4, pages 267 - 275. Jaf, Z., Altarawneh, M., Miran, H., Jiang, Z., Dlugogorski, B., (2017), Mechanisms governing selective hydrogenation ofacetylene over -Mo2N surfaces,	Catalysis Science & Technology, 7, 4, pages 943 - 960. Miran, H., Altarawneh, M., Jiang, Z., Oskierski, H., Almatarneh, M., Dlugogorski, B., (2017), Decomposition of selected chlorinated volatile organic compounds by ceria (CeO2)ï¿½,	Catalysis Science & Technology, 7, , pages 3902 - 3919. Ha, N., Minh Cam, L., Ha, N., Goh, B., Saunders, M., Jiang, Z., Altarawneh, M., Dlugogorski, B., El-Harbawi, M., Yin, C., (2017), Understanding the adsorptive interactions of arsenateï¿½ï¿½iron nanoparticles with curved fullerene-like sheets in activated carbon using a quantum mechanics/molecular mechanics computational approachï¿½,	Physical Chemistry Chemical Physics, 19, , pages 14262 - 14268. Rameshkumar, P., andikumar, A., Jiang, Z., Altarawneh, M., Huang, N., (2017), Colorimetric and visual dopamine assay based on the use of gold nanorods,	Microchimica Acta, 184, 10, pages 4125 - 4132. Hossain, M., Kabir, H., Rahman, M., Hasan, K., Bashare, M., Rahman, M., Gafur, M., Amri, A., Islam, S., Jiang, Z., Altarawneh, M., Dlugogorski, B., (2017), Understanding the Shrinkage of Optical Absorption Edges of Nanostructured Cd-Zn Sulphide Films for Photothermal Applications,	Applied Surface Science, 392, , pages 854 - 862. Widjaja, H., Oluwoye, I., Altarawneh, M., Hamra, A., Lim, H., Huang, N., Yin, C., Jiang, Z., (2017), Phenol Dissociation on Pristine and Defective Graphene,	Surface Science, 657, 2017, pages 10 - 14. Widjaja, H., Miran, H., Altarawneh, M., Oluwoye, I., Lim, H., Huang, N., Jiang, Z., Dlugogorski, B., (2017), DFT U and ab initio atomistic thermodynamics approache for mixed transitional metallic oxides: A case study of CoCu2O3 surface terminations,	Materials Chemistry and Physics, 201, , pages 241 - 250. Mohammadpour, E., Jiang, Z., Altarawneh, M., Mondinos, N., Rahman, M., Huang, N., Xie, Z., Zhou, Z., Dlugogorski, B., (2017), Experimental and predicted mechanical properties of Cr1ï¿½x AIxN thin films, at high temperatures, incorporating in situ synchrotron radiation X-ray diffraction and computational modelling,	RSC Advances, 7, , pages 22094 - 22104. Lim, H., Huang, N., Altarawneh, M., Jiang, Z., (2017), Electrospun graphene nanoplatelets-reinforced carbon nanofibers as potential supercapacitor electrode,	Materials Letters, 199, , pages 200 - 203. Assyaima, H., Bashid, a., Lim, H., Kamaruzaman, S., Rashid, S., Yunus, R., Huang, N., Yin, C., Rahman, M., Altarawneh, M., Jiang, Z., Alagarsamy, P., (2017), Electrodeposition of Polypyrrole and Reduced Graphene Oxide onto Carbon Bundle Fibre as Electrode forSupercapacitor,	Nanoscale Research Letters, 12, 1, pages 246 - 255. Rahman, M., Miran, H., Jiang, Z., Altarawneh, M., Chuah, L., Lee, H., Amri, A., Mondinos, N., Dlugogorski, B., (2017), Investigation of the post-annealing electromagnetic response of Cu-Co oxide coatings via optical measurement and computationalmodelling,	RSC Advances, 7, , pages 16826 - 16835. Zeng, J., Dlugogorski, B., Altarawneh, M., (2017), Flammability of CS2 and other reduced sulfur species,	Fire Safety Journal, 91, 2017, pages 226 - 234. Oluwoye, I., Altarawneh, M., Gore, J., Bockhorn, H., Dlugogorski, B., (2016), Oxidation of Polyethylene under Corrosive NOx Atmosphere,	The Journal of Physical Chemistry Part C: Nanomaterials, Interfaces and Hard Matter, 120, 7, pages 3766 - 3775. Altarawneh, M., Ahmed, O., Jiang, Z., Dlugogorski, B., (2016), Thermal Recycling of Brominated Flame Retardants with Fe2O3,	The Journal of Physical Chemistry Part A: Molecules, Spectroscopy, Kinetics, Environment and General Theory, 120, 30, pages 6039 - 6047. Saeed, A., Altarawneh, M., Hefter, G., Dlugogorski, B., (2016), Thermodynamic Parameters Including Acid Dissociation Constants for Bromochiorophenols (BCPs),	Journal of Chemical & Engineering Data, 61, 1, pages 160 - 172. Widjaja, H., Altarawneh, M., Jiang, Z., (2016), Trends of elemental adsorption on graphene,	Canadian Journal of Physics, 94, 5, pages 437 - 447. Jaf, Z., Jiang, Z., Miran, H., Altarawneh, M., (2016), Thermo-elastic and optical properties of molybdenum nitride,	Canadian Journal of Physics, 94, 9, pages 902 - 912. Rahman, M., Jiang, Z., Duan, X., Xie, Z., Tadich, A., Zhou, Z., Mondinos, N., Yin, C., Altarawneh, M., Dlugogorski, B., (2016), NEXAFS N K-edge study of the bonding structure on Al/Si doped sputtered CrN coatings,	Journal of Alloys and Compounds, 661, , pages 268 - 273. Rahman, M., Jiang, Z., Yin, C., Chuah, L., Lee, H., Amri, A., Goh, B., Wood, B., Creagh, C., Mondinos, N., Altarawneh, M., Dlugogorski, B., (2016), Structural Thermal Stability of Graphene Oxide-doped Copper-cobalt Oxide Coatings as a Solar Selective Surface,	Journal of Materials Science & Technology, 2016, 32, pages 1179 - 1191. Saeed, A., Altarawneh, M., Dlugogorski, B., (2016), Photodecomposition of bromophenols,	Chemosphere, 150, , pages 749 - 758. Jangi, M., Altarawneh, M., Dlugogorski, B., (2016), Large-eddy simulation of methanol pool fires using an accelerated stochastic fields method,	Combustion and Flame, 173, , pages 89 - 98. Widjaja, H., Altarawneh, M., Jiang, Z., Yin, C., Goh, B., Mondinos, N., Dlugogorski, B., (2016), Geometrical and orientational investigations on the electronic structure of graphene with adsorbed aluminium or silicon,	Materials & Design, 89, , pages 27 - 35. Widjaja, H., Jiang, Z., Altarawneh, M., Yin, C., Goh, B., Mondinos, N., Amri, A., Dlugogorski, B., (2016), Double-sided F and Cl adsorptions on graphene at various atomic ratios: Geometric, orientation and electronic structure aspects,	Applied Surface Science, 373, , pages 65 - 72. Rahman, M., Jiang, Z., Mondinos, N., Altarawneh, M., Zhou, Z., Xie, Z., Yin, C., (2016), Effects of annealing temperatures on the morphological, mechanical, surface chemical bonding, and solar selectivity properties of sputtered TiAlSiN thin films,	Journal of Alloys and Compounds, 671, , pages 254 - 266. Mosallanejad, S., Dlugogorski, B., Kennedy, E., Stockenhuber, M., Lomnicki, S., Assaf, N., Altarawneh, M., (2016), Formation of PCDD/Fs in Oxidation of 2-Chlorophenol on Neat Silica Surface,	Environmental Science & Technology (Washington), 50, 3, pages 1412 - 1418. Assaf, N., Altarawneh, M., Oluwoye, I., Radny, M., Lomnicki, S., Dlugogorski, B., (2016), Formation of Environmentally Persistent Free Radicals on alpha-Al2O3,	Environmental Science & Technology (Washington), 50, 20, pages 11094 - 11102. Altarawneh, M., Almatarneh, M., Marashdeh, A., Dlugogorski, B., (2016), Decomposition of ethylamine through bimolecular reactions,	Combustion and Flame, 163, , pages 532 - 539. Almatarneh, M., Barhoumi, L., Al-Tayyem, B., Abu-Saleh, A., AL-A'qarbeh, M., Abuorabi, F., AlShamaileh, E., Altarawneh, M., Marashdeh, A., (2016), Computational study for the second-stage cracking of the pyrolysis of ethylamine: Decomposition of methanimine, ethenamine, and ethanimine,	Computational and Theoretical Chemistry, 1075, , pages 9 - 17. Rahman, M., Jiang, Z., Munroe, P., Chuah, L., Zhou, Z., Xie, Z., Yin, C., Ibrahim, K., Amri, A., Kabir, H., Haque, M., Mondinos, N., Altarawneh, M., Dlugogorski, B., (2016), Chemical bonding states and solar selective characteristics of unbalanced magnetron sputtered TixM1-x-yNy films,	RSC Advances, 6, 43, pages 36373 - 36383. Altarawneh, M., Jaf, Z., Oskierski, H., Jiang, Z., Gore, J., Dlugogorski, B., (2016), Conversion of NO into N-2 over gamma-Mo2N,	The Journal of Physical Chemistry Part C: Nanomaterials, Interfaces and Hard Matter, 120, 39, pages 22270 - 22280. Assaf, N., Altarawneh, M., Radny, M., Jiang, Z., Dlugogorski, B., (2016), Interaction of Oxygen with alpha-Rhombohedral Boron (001) Surface,	The Journal of Physical Chemistry Part C: Nanomaterials, Interfaces and Hard Matter, 120, 11, pages 5968 - 5979. Altarawneh, M., Dlugogorski, B., (2015), Formation and Chlorination of Carbazole, Phenoxazine, and Phenazine,	Environmental Science & Technology (Washington), 49, 4, pages 2215 - 2221. Ahubelem, N., Shah, K., Moghtaderi, B., Altarawneh, M., Dlugogorski, B., Page, A., (2015), Formation of chlorobenzenes by oxidative thermal decomposition of 1,3-dichloropropene,	Combustion and Flame, 162, 6, pages 2414 - 2421. Dorado, J., Dlugogorski, B., Kennedy, E., Mackie, J., Gore, J., Altarawneh, M., (2015), Decomposition of S-nitroso species,	RSC Advances, 5, 38, pages 29914 - 29923. Widjaja, H., Jiang, Z., Altarawneh, M., Mondinos, N., Yin, C., Goh, B., Dlugogorski, B., (2015), Towards a better understanding of the geometrical and orientational aspects of the electronic structure of halogens (F-I) adsorption on graphene,	Applied Surface Science, 356, , pages 370 - 377. Oluwoye, I., Altarawneh, M., Gore, J., Dlugogorski, B., (2015), Oxidation of crystalline polyethylene,	Combustion and Flame, 162, 10, pages 3681 - 3690. Altarawneh, M., Marashdeh, A., Dlugogorski, B., (2015), Structures, electronic properties and stability phase diagrams for copper(I/II) bromide surfaces,	Physical Chemistry Chemical Physics, 17, 14, pages 9341 - 9351. Altarawneh, M., Dlugogorski, B., (2015), Formation of polybrominated dibenzofurans from polybrominated biphenyls,	Chemosphere, 119, , pages 1048 - 1053. Altarawneh, M., Dlugogorski, B., (2015), Formation of dibenzofuran, dibenzo-p-dioxin and their hydroxylated derivatives from catechol,	Physical Chemistry Chemical Physics, 17, 3, pages 1822 - 1830. Altarawneh, M., Dlugogorski, B., (2015), Reactions of HO2 with n-propylbenzene and its phenylpropyl radicals,	Combustion and Flame, 162, 4, pages 1406 - 1416. Mohammadpour, E., Jiang, Z., Altarawneh, M., Xie, Z., Zhou, Z., Mondinos, N., Kimpton, J., Dlugogorski, B., (2015), Predicting high temperature mechanical properties of CrN and CrAlN coatings from in-situ synchrotron radiation X-ray diffraction,	Thin Solid Films, 599, , pages 98 - 103. Dorado, J., Dlugogorski, B., Kennedy, E., Mackie, J., Gore, J., Altarawneh, M., (2015), S-Nitrosation of Aminothiones,	The Journal of Organic Chemistry, 80, 14, pages 6951 - 6958. Saeed, A., Altarawneh, M., Dlugogorski, B., (2015), Formation of mixed halogenated dibenzo-p-dioxins and dibenzofurans (PXDD/Fs),	Chemosphere, 137, , pages 149 - 156. Altarawneh, M., Dlugogorski, B., (2014), Mechanisms of transformation of polychlorinated diphenyl ethers into polychlorinated dibenzo-p-dioxins and dibenzofurans,	Chemosphere, 114, , pages 129 - 135. Rawadieh, S., Altarawneh, M., Altarawneh, I., Shaweesh, M., (2014), Mechanisms for the formation of polychlorinated dibenzo-p-dioxins and furans (PCDD/Fs) from chlorinated toluenes,	Reaction Kinetics, Mechanisms and Catalysis, 112, 2, pages 321 - 333. Altarawneh, M., Dlugogorski, B., (2014), Mechanism of Thermal Decomposition of Tetrabromobisphenol A (TBBA),	Journal of the American Chemical Society, 118, 40, pages 9338 - 9346. Almatarneh, M., Altarawneh, M., Poirier, R., Saraireh, I., (2014), High level ab initio, DFT, and RRKM calculations for the unimolecular decomposition reaction of ethylamine,	Journal of Computational Science, 5, 4, pages 568 - 575. Ahubelem, N., Altarawneh, M., Dlugogorski, B., (2014), Dehydrohalogenation of ethyl halides,	Tetrahedron Letters, 35, , pages 4860 - 4868. Altarawneh, M., Jiang, Z., Dlugogorski, B., (2014), The structures and thermodynamic stability of copper(ii) chloride surfaces,	Physical Chemistry Chemical Physics, 16, 44, pages 24209 - 24215. Altarawneh, M., Saraireh, S., (2014), Theoretical insight into chlorine adsorption on the Fe(100) surface,	Physical Chemistry Chemical Physics, 16, 18, pages 8575 - 8581. Altarawneh, M., Dlugogorski, B., (2014), Thermal Decomposition of 1,2-Bis(2,4,6-tribromophenoxy)ethane (BTBPE), a Novel Brominated Flame Retardant,	Environmental Science & Technology (Washington), 48, 24, pages 14335 - 14343. Saraireh, S., Altarawneh, M., (2014), Thermodynamic stability and structures of iron chloride surfaces: A first-principles investigation,	The Journal of Chemical Physics, 141, 5, pages 0 - 0. 1- Altarawneh, M., Dlugogorski, B. Z., Kennedy, E. M., & Mackie, J. C. (2009). Mechanisms for formation, chlorination, dechlorination and destruction of polychlorinated dibenzo-p-dioxins and dibenzofurans (PCDD/Fs). Progress in Energy and Combustion Science, 35(3), 245-274. 2. Al-Muhtaseb, A. H., & Altarawneh, M. (2011). Theoretical study on thermochemical parameters of chlorinated isomers of acetophenone. Computational and Theoretical Chemistry, 966(1-3), 38-43. 3. Al-Muhtaseb, A. H., Altarawneh, M., Almatarneh, M. H., Poirier, R. A., & Assaf, N. W. (2011). Theoretical study on the unimolecular decomposition of thiophenol. Journal of Computational Chemistry, 32(12), 2708-2715. 4. Alsoufi, A., Altarawneh, M., Dlugogorski, B. Z., Kennedy, E. M., & Mackie, J. C. (2010). A DFT study on the self-coupling reactions of the three isomeric semiquinone radicals. Journal of Molecular Structure: THEOCHEM, 958(1-3), 106-115. 5. Altarawneh, M., Dlugogorski, B. Z, MacKie, J. C., & Kennedy, E. M., &. (2013). Theoretical investigation into the low-temperature oxidation of ethylbenzene. Proceedings of the Combustion Institute, 34(1), 315-323. 6. Altarawneh, I., Altarawneh, K., Al-Muhtaseb, A. H., Alrawadieh, S., & Altarawneh, M. (2012). Theoretical study of thermochemical and structural parameters of chlorinated isomers of aniline. Computational and Theoretical Chemistry, 985, 30-35. 7. Altarawneh, M. (2012). A theoretical study on the pyrolysis of perfluorobutanoic acid as a model compound for perfluoroalkyl acids. Tetrahedron Letters, 53(32), 4070-4073. 8. Altarawneh, M., Al-Muhtaseb, A. H., Almatarneh, M. H., Poirier, R. A., Assaf, N. W., & Altarawneh, K. K. (2011). Theoretical investigation into competing unimolecular reactions encountered in the pyrolysis of acetamide. Journal of Physical Chemistry A, 115(48), 14092-14099. 9. Altarawneh, M., Al-Muhtaseb, A. H., Dlugogorski, B. Z., Kennedy, E. M., & MacKie, J. C. (2011). Rate constants for hydrogen abstraction reactions by the hydroperoxyl radical from methanol, ethenol, acetaldehyde, toluene, and phenol. Journal of Computational Chemistry, 32(8), 1725-1733. 10. Altarawneh, M., Al-Muhtaseb, A. H., Dlugogorski, B. Z., Kennedy, E. M., & MacKie, J. C. (2010). Theoretical study on the thermodynamic properties and self-decomposition of methylbenzenediol isomers. Journal of Physical Chemistry A, 114(43), 11751-11760. 11. Altarawneh, M., & Altarawneh, K. (2012). A theoretical study on the bimolecular reactions encountered in the pyrolysis of acetamide. Journal of Physical Organic Chemistry, 25(5), 431-436. 12. Altarawneh, M., Carrizo, D., Ziolkowski, A., Kennedy, E. M., Dlugogorski, B. Z., & Mackie, J. C. (2009). Pyrolysis of permethrin and formation of precursors of polychlorinated dibenzo-p-dioxins and dibenzofurans (PCDD/F) under non-oxidative conditions. Chemosphere, 74(11), 1435-1443. 13. Altarawneh, M., Dar, T., & Dlugogorski, B. Z. (2012). Thermochemical parameters and pK a values for chlorinated congeners of thiophenol. Journal of Chemical and Engineering Data, 57(6), 1834-1842. 14. Altarawneh, M., & Dlugogorski, B. Z. (2012). A mechanistic and kinetic study on the decomposition of morpholine. Journal of Physical Chemistry A, 116(29), 7703-7711. 15. Altarawneh, M., Dlugogorski, B. Z., Kennedy, E. M., & Mackie, J. C. (2008). Quantum chemical and kinetic study of formation of 2-chlorophenoxy radical from 2-chlorophenol: Unimolecular decomposition and bimolecular reactions with H, OH, cl, and O 2. Journal of Physical Chemistry A, 112(16), 3680-3692. 16. Altarawneh, M., Dlugogorski, B. Z., Kennedy, E. M., & Mackie, J. C. (2007). Quantum chemical investigation of formation of polychlorodibenzo-p-dioxins and dibenzofurans from oxidation and pyrolysis of 2-chlorophenol. Journal of Physical Chemistry A, 111(13), 2563-2573. 17. Altarawneh, M., Dlugogorski, B. Z., Kennedy, E. M., & Mackie, J. C. (2006). Quantum chemical study of low temperature oxidation mechanism of dibenzofuŕan. Journal of Physical Chemistry A, 110(50), 13560-13567. 18. Altarawneh, M., Dlugogorski, B. Z., Kennedy, E. M., & Mackie, J. C. (2007). Theoretical study of reaction pathways of dibenzofuran and dibenzo-p-dioxin under reducing conditions. Journal of Physical Chemistry A, 111(30), 7133-7140. 19. Altarawneh, M., Dlugogorski, B. Z., Kennedy, E. M., & Mackie, J. C. (2010). Theoretical study of reactions of HO 2 in low-temperature oxidation of benzene. Combustion and Flame, 157(7), 1325-1330. 20. Altarawneh, M., Dlugogorski, B. Z., Kennedy, E. M., & Mackie, J. C. (2010). Theoretical study of unimolecular decomposition of catechol. Journal of Physical Chemistry A, 114(2), 1060-1067. 21. Altarawneh, M., Dlugogorski, B. Z., Kennedy, E. M., & Mackie, J. C. (2010). Thermochemical properties and decomposition pathways of three isomeric semiquinone radicals. Journal of Physical Chemistry A, 114(2), 1098-1108. 22. Altarawneh, M., Kennedy, E. M., Dlugogorski, B. Z., & Mackie, J. C. (2008). Computational study of the oxidation and decomposition of dibenzofuran under atmospheric conditions. Journal of Physical Chemistry A, 112(30), 6960-6967. 23. Altarawneh, M., Radny, M. W., Smith, P. V., Mackie, J. C., Kennedy, E. M., & Dlugogorski, B. Z. (2008). 2-chlorophenol adsorption on cu(1 0 0): First-principles density functional study. Surface Science, 602(8), 1554-1562. 24. Altarawneh, M., Radny, M. W., Smith, P. V., Mackie, J. C., Kennedy, E. M., & Dlugogorski, B. Z. (2008). Adsorption of chlorophenol on the cu(1 1 1) surface: A first-principles density functional theory study. Applied Surface Science, 254(14), 4218-4224. 26. Altarawneh, M., Radny, M. W., Smith, P. V., Mackie, J. C., Kennedy, E. M., Dlugogorski, B. Z., Stampfl, C. (2010). Adsorption of 2-chlorophenol on cu 2O(1 1 1)-cu CuS: A first-principles density functional study. Applied Surface Science, 256(15), 4764-4770. 27. Altarawneh, M. K., Dlugogorski, B. Z., Kennedy, E. M., & Mackie, J. C. (2013). Rate constants for reactions of ethylbenzene with hydroperoxyl radical. Combustion and Flame, 160(1), 9-16. 28. Batiha, M., Al-Muhtaseb, A. H., & Altarawneh, M. (2012). Theoretical study on the reaction of the phenoxy radical with O 2, OH, and NO 2. International Journal of Quantum Chemistry, 112(3), 848-857. 29. Batiha, M., Altarawneh, M., Al-Harahsheh, M., Altarawneh, I., & Rawadieh, S. (2011). Theoretical derivation for reaction rate constants of H abstraction from thiophenol by the H/O radical pool. Computational and Theoretical Chemistry, 970(1-3), 1-5. 30. Batiha, M., Altarawneh, M., Alsofi, A., Al-Harahsheh, M., Altarawneh, I., & Alrawadieh, S. (2011). Theoretical study on the reaction of hydrogen atoms with aniline. Theoretical Chemistry Accounts, 129(6), 823-832. 31. Chen, K., Wojtalewicz, D., Altarawneh, M., MacKie, J. C., Kennedy, E. M., & Dlugogorski, B. Z. (2011). Formation of polychlorinated dibenzo-p-dioxins and dibenzofurans (PCDD/F) in oxidation of captan pesticide. Paper presented at the Proceedings of the Combustion Institute, , 33(1) 701-708. 33- Rayson, M. S., Altarawneh, M., Mackie, J. C., Kennedy, E. M., & Dlugogorski, B. Z. (2010). Theoretical study of the ammonia-hypochlorous acid reaction mechanism. Journal of Physical Chemistry A, 114(7), 2597-2606. 35- Summoogum, S. L., Altarawneh, M., Mackie, J. C., Kennedy, E. M., & Dlugogorski, B. Z. (2012). Oxidation of dibenzo-p-dioxin: Formation of initial products, 2-methylbenzofuran and 3-hydro-2-methylenebenzofuran. Combustion and Flame, 159(10), 3056-3065. 36- Summoogum, S. L., Wojtalewicz, D., Altarawneh, M., MacKie, J. C., Kennedy, E. M., & Dlugogorski, B. Z. (2013). Formation of polychlorinated dibenzo-p-dioxins and polychlorinated dibenzofurans (PCDD/F) by precursor pathways in oxidation of pesticide alpha-cypermethrin. Proceedings of the Combustion Institute, 34(2), 3499-3507. 37- Sun, Q., Altarawneh, M., Dlugogorski, B. Z., Kennedy, E. M., & Mackie, J. C. (2007). Catalytic effect of CuO and other transition metal oxides in formation of dioxins: Theoretical investigation of reaction between 2,4,5-trichlorophenol and CuO. Environmental Science and Technology, 41(16), 5708-5715. 38- Altarawneh, M., Dlugogorski, B. Z.,. Environmental Science and Technology, (2013) A mechanistic and kinetic study on the formation of PBDD/Fs from PBDEs 47(16), 5518-5527. 40- Saraeireh, S, Altarawneh M, Density Functional Theory periodic slab calculations of adsorption and dissociation of H2O on the Cu2O(110):CuO, Canadian journal of chemistry, 10.1139/cjp-2013-0272. 41- Rawadieh, S, Altarawneh, I, Altarawneh M, , Theoretical Study on the decomposition of proline, (2013), Computational and Theoretical Chemistry, 1018, 45-49. 43- Altarawneh, M, Saraireh, S. Theoretical Insight into Chlorine Adsorption on the Fe (100) surface. Physical Chemistry Chemical Physics (2014), Accepted, DOI: 10.1039/C4CP00220B. 44- Almatarneh, M.H., Altarawneh, M., Poirier, R.A. and Saraireh, I.A. (2014) High level ab initio, DFT, and RRKM calculations for the unimolecular decomposition reaction of ethylamine. Journal of Computational Science, In press, http://dx.doi.org/10.1016/j.jocs.2014.02.003 . 45- Altarawneh M, & Dlugogorski B.Z, Mechanisms for formation of pollutants in fires, Proceeding of the Seventh International Seminar on Fire and Explosion Hazards (ISFEH7), 27-36, University of Maryland, Providence, RI, USA., May, 2013. 48- Summoogun S, Dlugogorski B.Z, Altarawneh M, Mackie J.C, & Kennedy E.M, Decomposition of Dibenzo-p-dioxin in fires, the sixth International Seminar on Fire and Explosion Hazards, Leeds (2010), 747-759..
49- Altarawneh M, Mackie J.C, Kennedy E.M, & Dlugogorski B.Z, Rate Constants for Hydrogen Abstraction Reactions by the Hydroperoxyl Radical from Methanol, Ethenol, Acetaldehyde, Toluene and Phenol, Proceedings of the Australian Combustion Symposium 2009, 12-16, Sydney (2009). 50- Dar T, Altarawneh M, & Dlugogorski B.Z, Theoretical study in the dimerisation of 2-chlrothiophenol/2-chlorothiophenoxy: Precursors to PCDT/TA, Organohalogen Compounds, 2012, 74, 657-660. Presented at the 32nd International Symposium on Halogenated Persistent organic Pollutants, Cairns, Australia, August 2012. 51- Altarawneh M, & Dlugogorski B.Z, A mechanistic insight into the atmospheric decomposition of fluorotelomer alcohols (FTOHs), Organohalogen Compounds, 2012, 74, 407-411. Presented at the 32nd International Symposium on Halogenated Persistent organic Pollutants, Cairns, Australia, August 2012. 52- Altarawneh M, & Dlugogorski B.Z, Theoretical investigation into the atmospheric reactions of fluorotelomer alcohols (FTOHs), Organohalogen Compounds, 2012, 74, 383-387. Presented at the 32nd International Symposium on Halogenated Persistent organic Pollutants, Cairns, Australia, August 2012. 53- Ahubelem N, Altarawneh M, & Dlugogorski B.Z, Unimolecular decomposition of C3Cl6: pathways for formation of cylic chlorinated compounds, Organohalogen Compounds, 2012, 74, 640-643. Presented at the 32nd International Symposium on Halogenated Persistent organic Pollutants, Cairns, Australia, August 2012. 54- Ahubelem N, Altarawneh M, & Dlugogorski B.Z, Unimolecular decomposition of C3Cl6: pathways for formation of cylic chlorinated compounds, Organohalogen Compounds, 2012, 74, 640-643. Presented at the 32nd International Symposium on Halogenated Persistent organic Pollutants, Cairns, Australia, August 2012. 55- Altarawneh M, Mackie J.C, Kennedy E.M, & Dlugogorski B.Z, Mechanisms for PCDF and PCB formation from fires: Proceeding of the 7th Asia-Oceania Symposium on Fire Science and Technology (AOAFST) Hong Kong, September, 2007. 56- Ahubelem N, Altarawneh M, & Dlugogorski B.Z, Kinetic and Mechanistic Study into Emission of HCl in Fires of PVC, Proceeding of the Seventh International Seminar on Fire and Explosion Hazards (ISFEH7), 353-362, University of Maryland, Providence, RI, USA., May, 2013. 57- Dar, T, Altarawneh M, & Dlugogorski B.Z, Theoretical Study onto the Decomposition of Thiophenic Compounds in Accidental and Spontaneous Fires of Coal, proceeding of the Seventh International Seminar on Fire and Explosion Hazards (ISFEH7), 391-400, University of Maryland, Providence, RI, USA., May, 2013. 58- Hou, S., Dlugogorski, B.Z., Altarawneh, M., Mackie, J.C., & Kennedy, E.M, Formation of Chlorinated Dibenzo-p-dioxins and Dibenzofurans (CDD/F) and Their Precursors in Oxidation of 4-Chlorobiphenyl, Proceeding of the Seventh International Seminar on Fire and Explosion Hazards (ISFEH7), 371-380, University of Maryland, Providence, RI, USA., May, 2013.